I was shocked to read the news on March 31st that the iconic Iranian-born architect Zaha Hadid had passed away of a heart attack at just 65 years of age. Images of some of her amazing buildings which I had visited over the years spun in my head as I took in the terrible news. 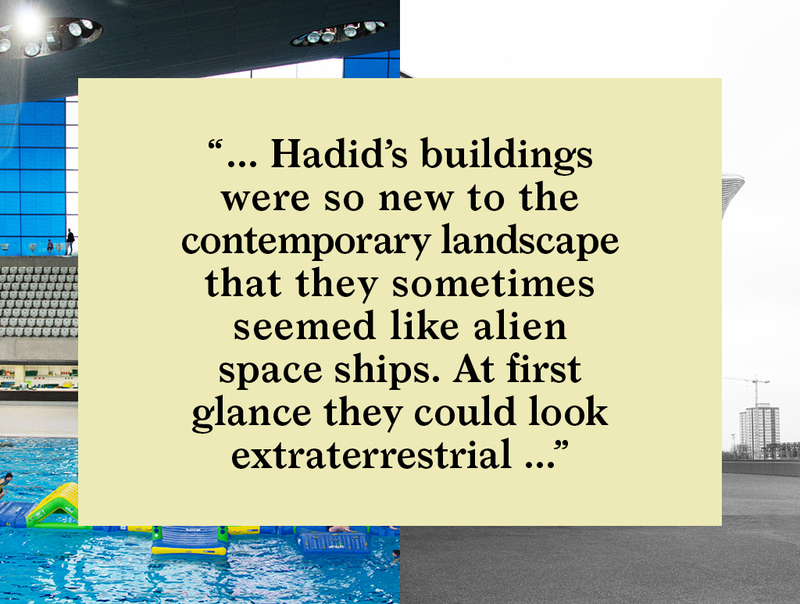 Known for her distinctive fluid and curvy buildings, Hadid’s architecture was so new to the contemporary landscape that they sometimes seemed like alien space ships. At first glance they could look extraterrestrial, but with the passing of time, they seamlessly blended into the urban landscape, equally at home in a contemporary environment as an ancient castle. 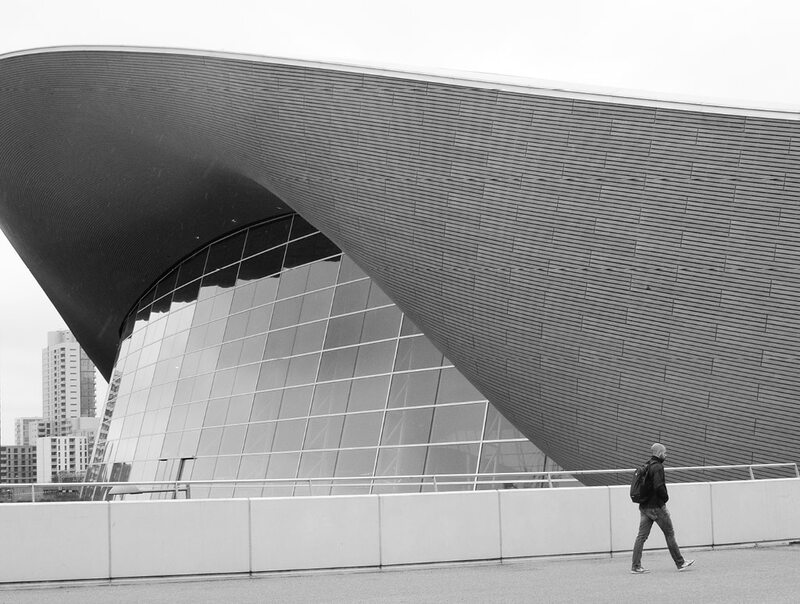 One of her particularly fluid buildings, where form and purpose are uniquely melded into one, was the London Aquatic Centre, situated in London’s East End in Queens Olympic Park. 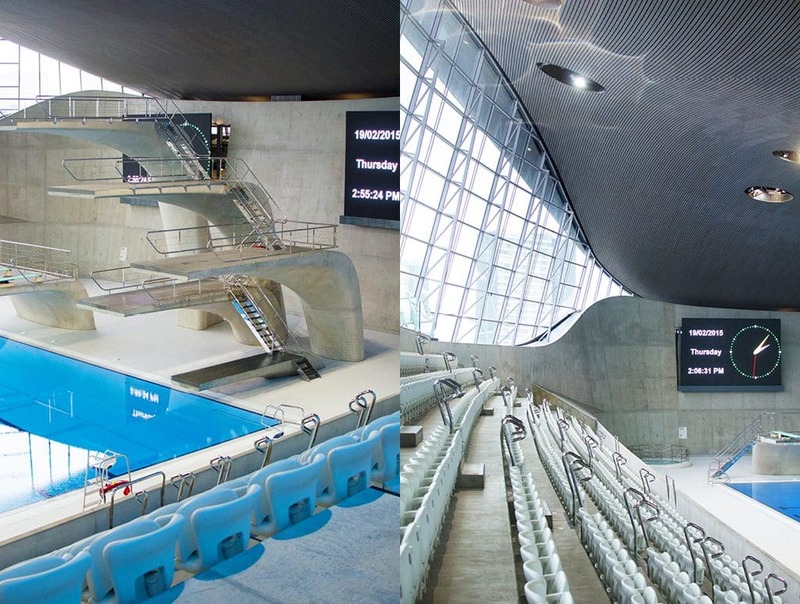 The Centre was designed for the London 2012 Olympics, to host the swimming, diving, and synchronized swimming competitions. Naturally, the building’s form is inspired by the movement of water. 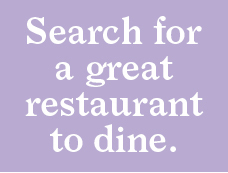 This is an idea not entirely evident to all who visit. Striking up a conversation with an elderly lady in the park, “Looks to me like an Ascot hat … don’t you think?” she said. Hmm, she had a point. I replied, “Well I am off to take a dip in the hat then.” She wished me “good day” and was off, her own hat pinned perfectly in place. 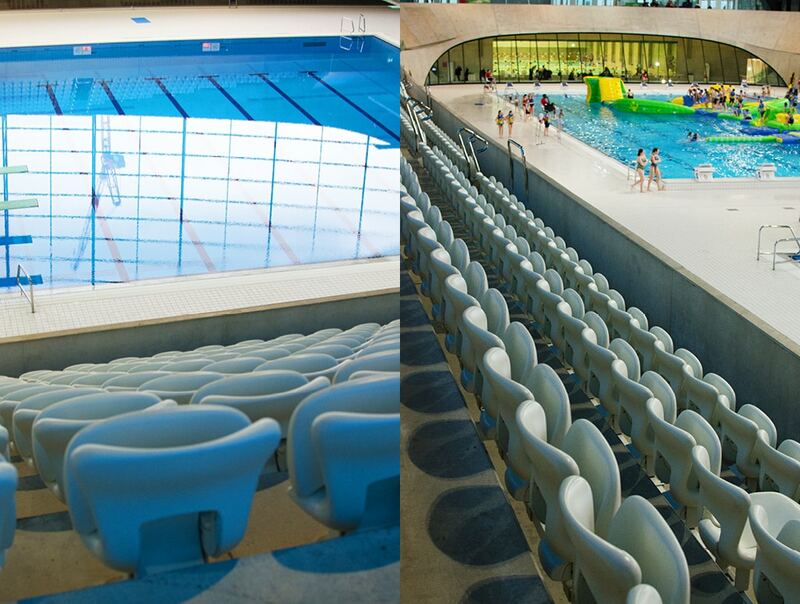 The facility contains three swimming pools. 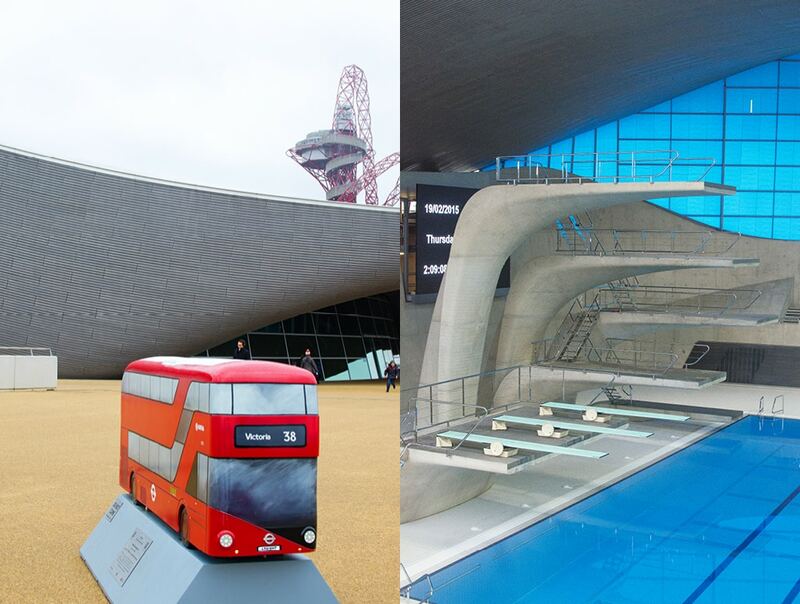 The competition pool is the largest at 50 meters long, the equivalent of four London double decker buses, and 3 meters deep. 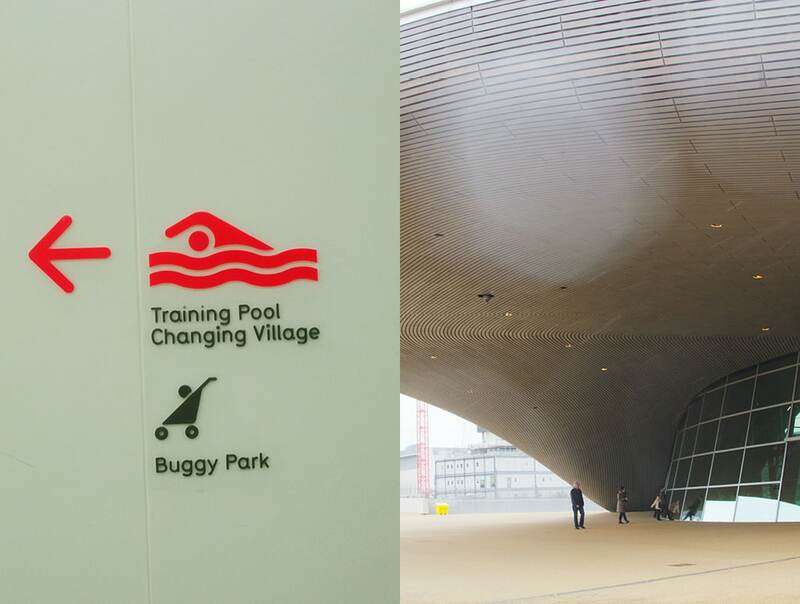 The training pool is also 50 meters long but is usually split in half with a bridge to form two 25 meter pools. 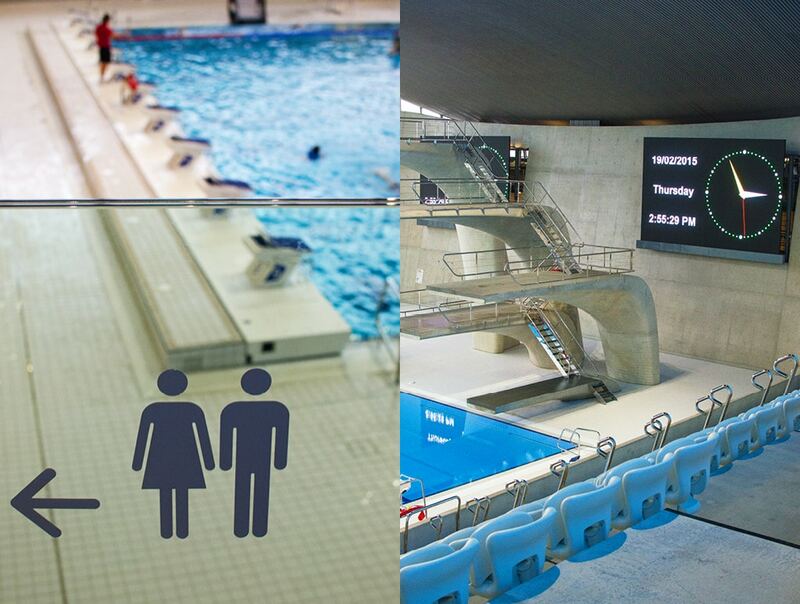 The diving pool is 25 meters. 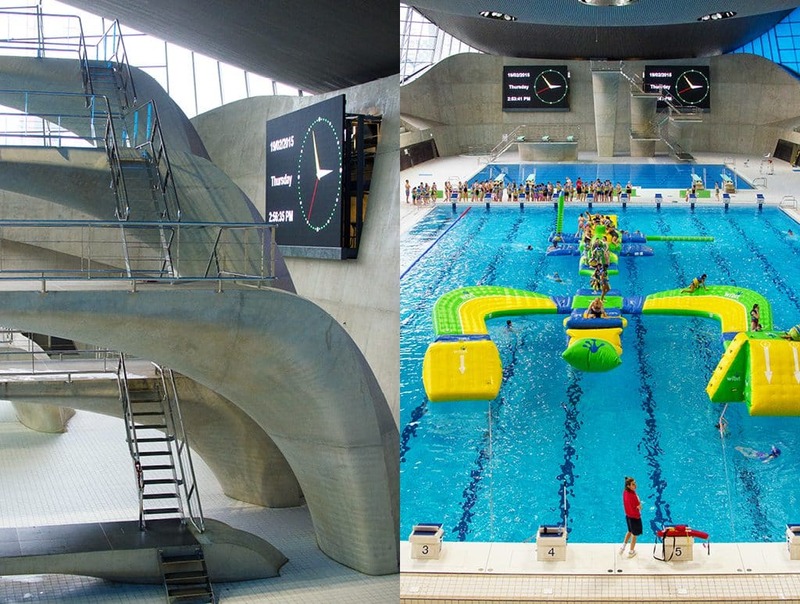 The three diving platforms are tongue-like sentinels that seem to keep watch over the pools. But there are lifeguards on duty to do that job as well. I came to do laps so I headed for the competition pool. Most days it’s organized by speed, which makes it seem competitive, and almost like an authentic Olympic swimming experience. Marked as slow, medium and fast, you must pick the lane befitting your individual zippiness. Once you slip into a lane you feel part of Olympic history, as it was in those very lanes that Michael Phelps won his six medals, closing his Olympic career on a high note. I still remember his amazing 100-meter butterfly stroke swim like it was yesterday. Swimming in the same lane as that historic performance helps. I do my best to honor those 32 medals won by the US Swim Team, and summon my best butterfly stroke. 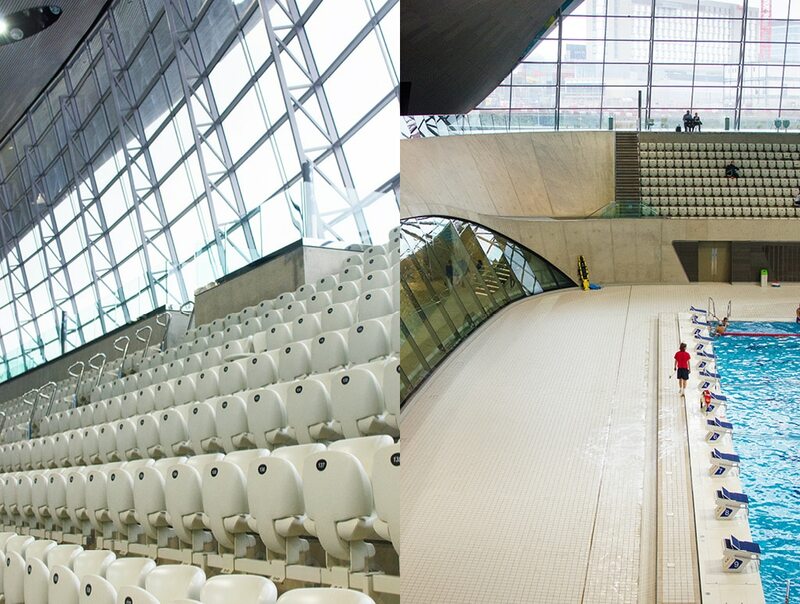 What I really appreciate about Zaha Hadid’s pool is its super smart layout, which quickly moves you from the entrance, through the changing rooms, and on to the pool. With very little effort you are in the water, and once in the water, you get the full effect of the voluminous interior. With massive glass walls on each side of the building, you feel like you are outside even on a dull English day. The space is flooded with light. 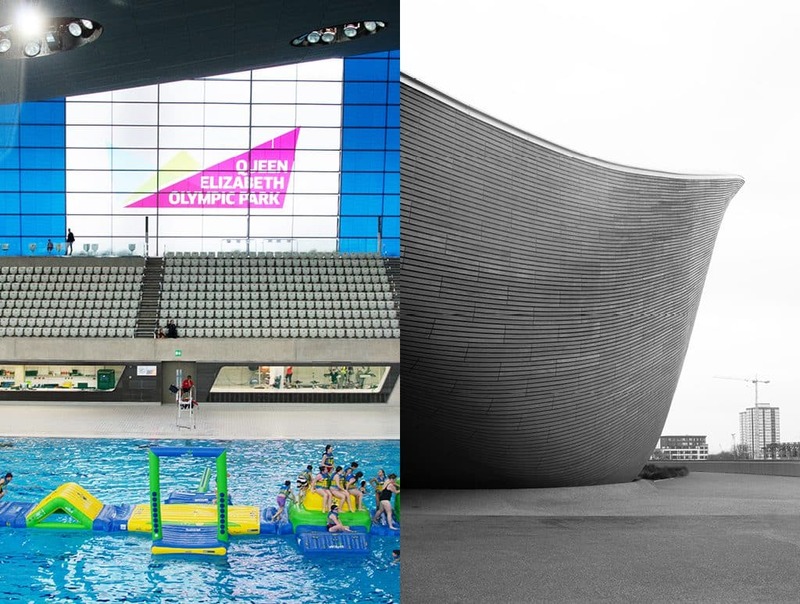 Speaking of swimming outdoors, did you know that until the 1908 London Olympics, swimming competitions were held solely in open water like lakes or rivers? A far cry from this high-tech water ship. With my laps complete, it was time to move on. After a cup of tea from the cafe, I made my way back to the tube station. 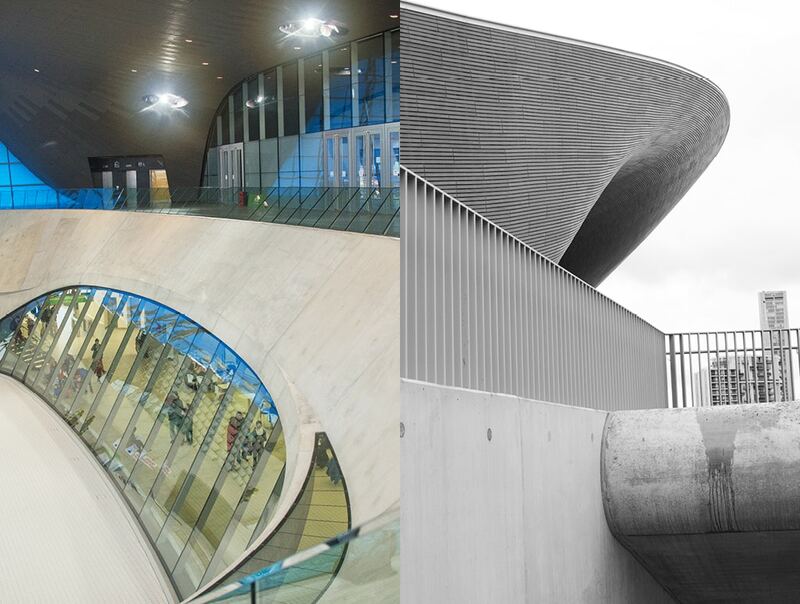 Turning back, I took one more look at Zaha Hadid’s building. What a wonderful gift she has given the people of London, and the occasional visitor, like me. Planning a trip to Queen’s Park in East London? Here is the current weather and what to expect for the next few days.